Baby corn and spring onion veggie is so popular that one does not need any introduction at all. The combination of these two veggies with a little cheese gave a thumps up to the soup recipe. 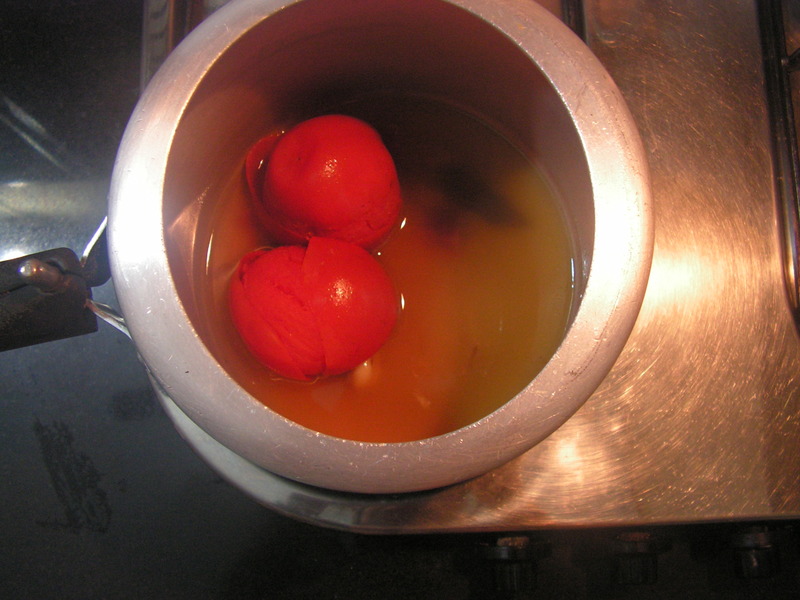 This is the third soup recipe on this blog the second being “Tomato soup” and the first and the fore most being the “Palak soup”. 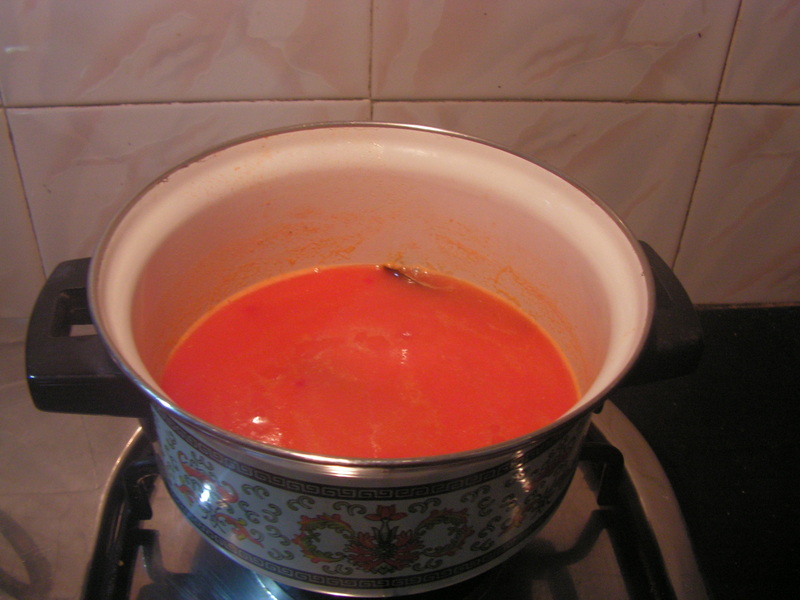 These days soup is prepared at home and i gave a try to this soup recipe a couple of times and was a super hit . So i thought of sharing it with my viewers. Here it goes!!! 1. Wash and chop tomato, peal and chop potatoes, wash and chop spring onions, grate ginger, peal and grate garlic to make a paste . 2. 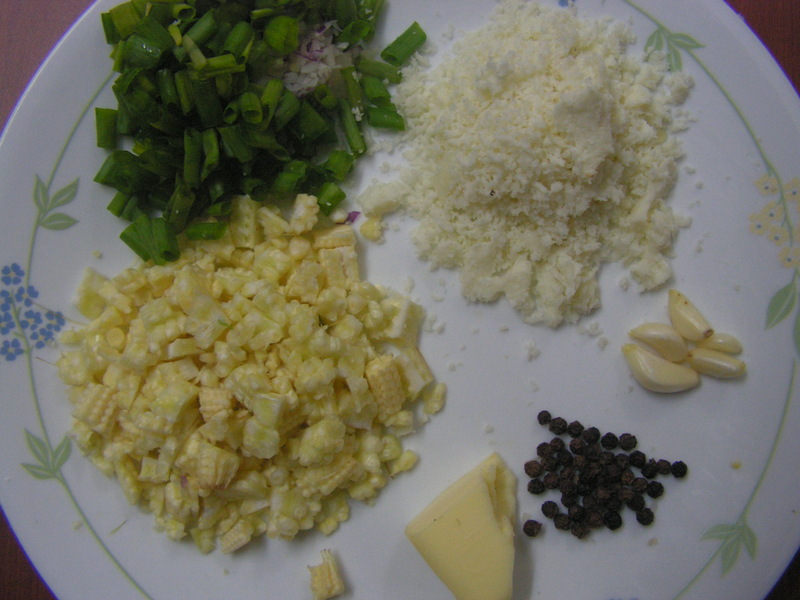 Peal and chop baby corn fine, peal garlic , chop spring onions and powder pepper and keep it aside. 3. 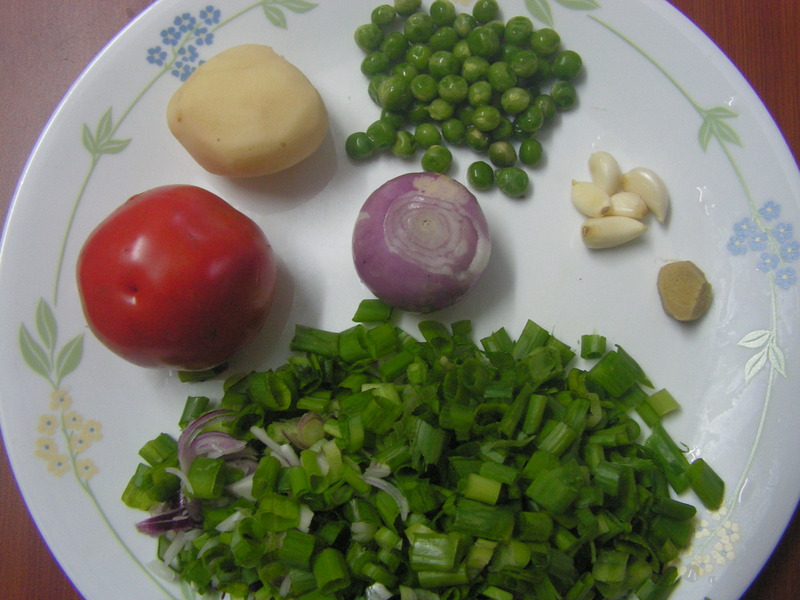 Cook chopped tomato potato, green peas, spring onions in the cooker till done. 6. Strain the stock from the veg pulp. Add water from the cooked veggie to the pulp and bring it to required consistency. 8. Add the cooked /strained veggie pulp from step-6 to it and bring it to boil simmering the flame. Transfer it to a serving bowl. Serve piping hot in a soup bowl garnishing with spring onion, pepper powder & salt if needed!! Note: 1. 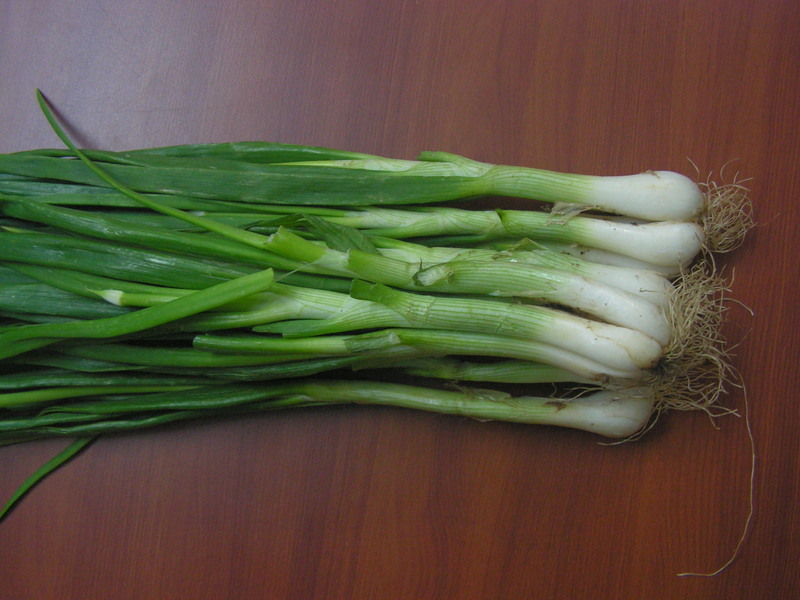 Use fresh veggies for best result especially the spring onions . 2. Adding cheese is one’s choice for better flavour. 3. One can even add 2 tablespoons of lentil if needed. 4. Adding sugar is one’s option. This entry was posted in Uncategorized and tagged Soups, starters. 1. 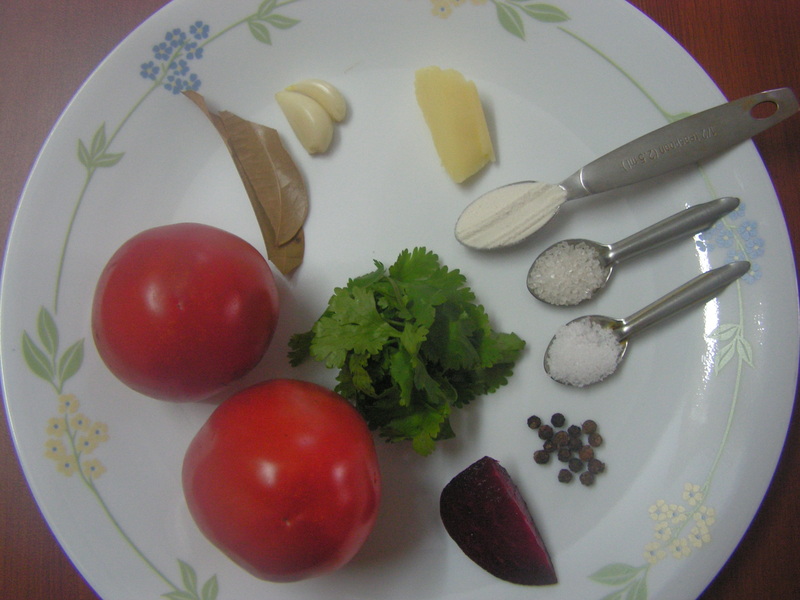 Wash tomatoes, peal and chop garlic , and also wash, peal and cut a small piece of Beetroot and keep it aside. 2. 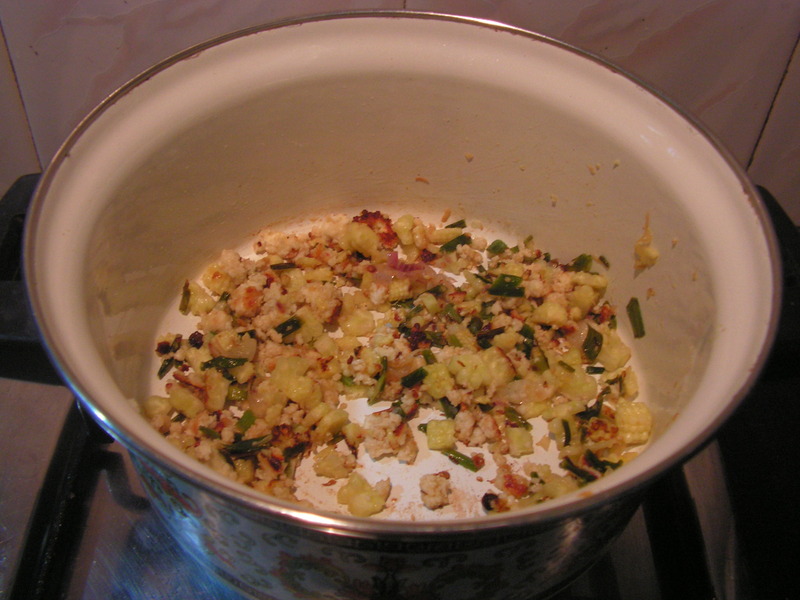 Place small cooker with butter in it and add bay leaves and chopped garlic, and fry for a minute. 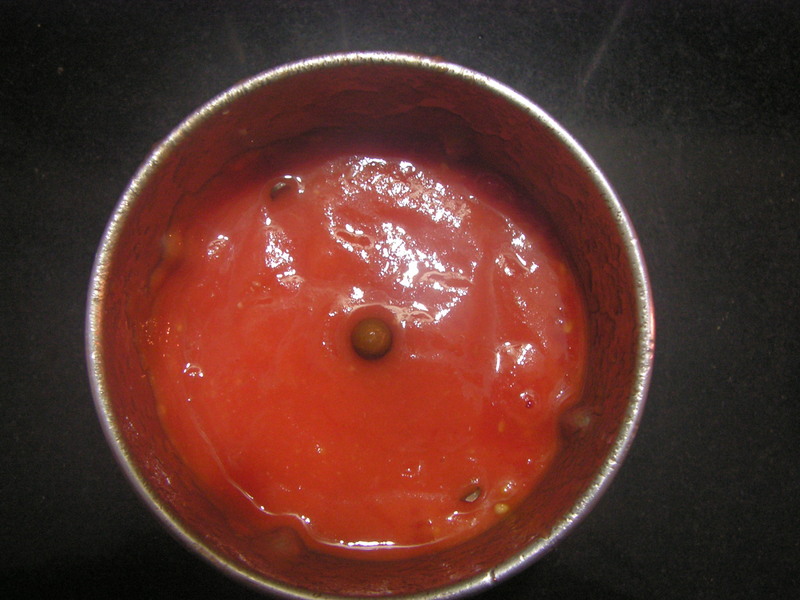 When done add tomato and a piece of beetroot to it and also a cup of water. 3. 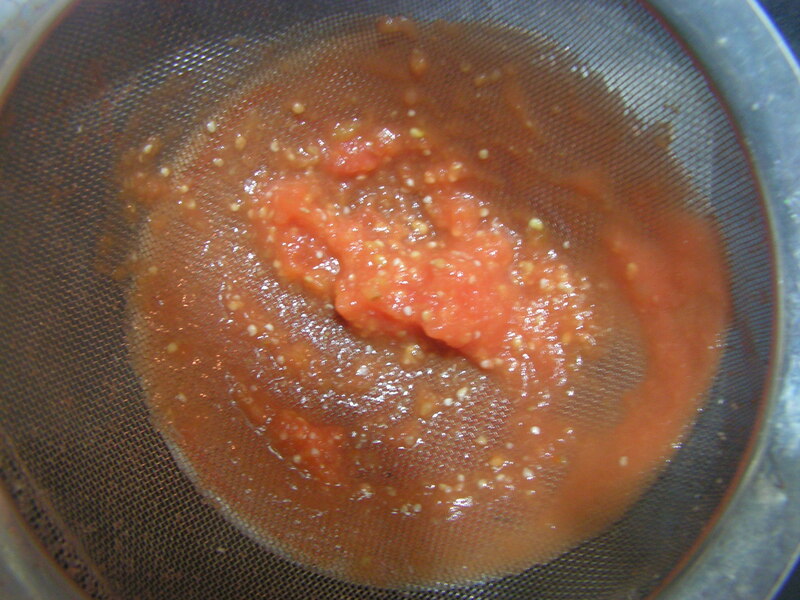 Strain it through a strainer in a wide bowl to remove the seeds. 4. Add some more water and heat it again in a separate bowl simmering the flame adding sugar, salt and also bay leaf. 5. 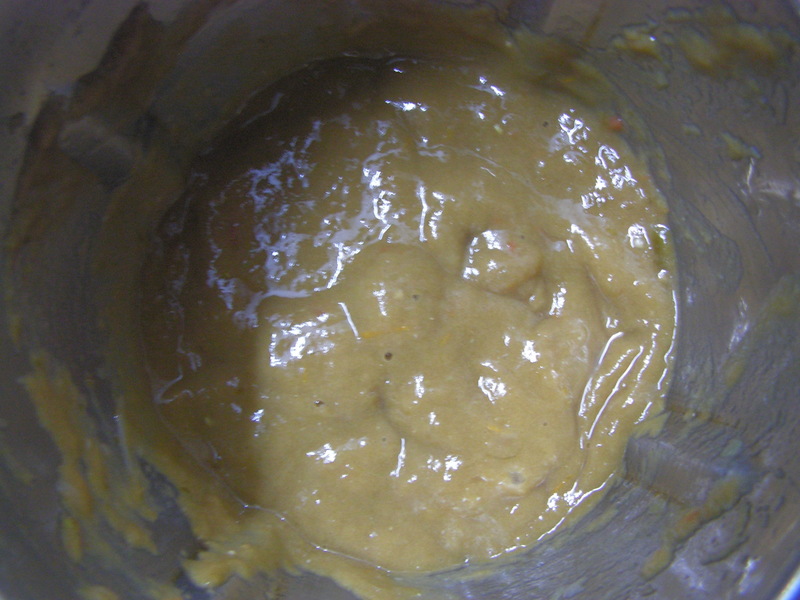 Mix corn flour in 1 tablespoon of water and add to it and bring it to boil till it thickens. 6. Add salt, pepper powder an finally garnish with cilantro. 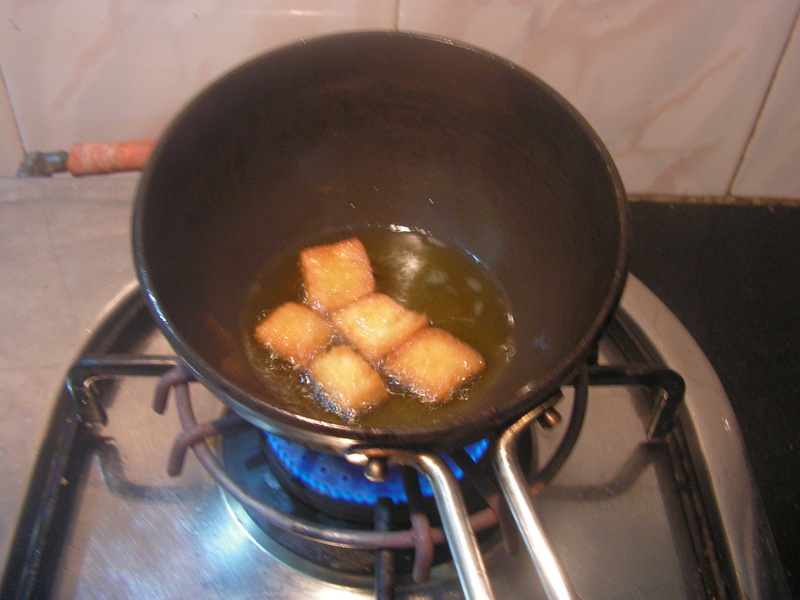 Adding cream is optional In the mean time fry a few bread croutons in oil/ghee and top it with fried bread croutons and serve piping hot. 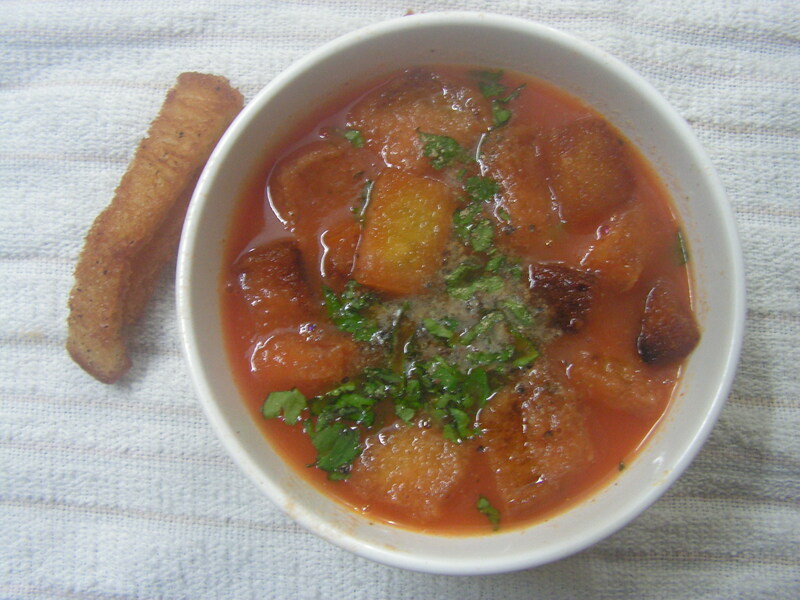 Yum-mm with crunchy bread croutons!!!! Note: 1. Use ripe and pulpy tomatoes for the dish for best results and flavour. 2. I have used a piece of beetroot for natural colour. 3. Using bread croutons is one’s option. 4. Using cream for garnishing is also one’s option. I did not want it to be rich so i have avoided. This entry was posted in Uncategorized and tagged Appetizer, Soups, starters. Amla is Nellikayi, Goosbery and Avalo (in konkani). Medicinal qualities, pickling ingredient, hair oil, its everywhere. Today I would like to put up “Amla Saaru”, something that is typically used as a soup for patients recovering from the common stomach upsets and fever. I tried this when I was recovering and it worked for me ! Here it is. 2. Remove the seeds of the salted amla and mix it in the blender to a fine consistency. 3. Transfer the ground pulp to a bowl and required quantity of water to bring it to the required consistency. Add slit green chillies, bilimbi and a little tamarind and bring it to boil on a medium flame. There is no need to add extra salt since amla is salted. 4. Place a spatula with 3-4 teaspoons of cooking oil on the flame. Add chopped garlic to it and fry it till light brown. When half done add broken red chillis and later on add turmeric powder to it. 5. Add this seasoning to the Amla liquid from step 4 to it. Serve hot with rice and enjoy. I know those who season this with mustard, asafoetida, red chilly and curry leaves as well. Also those who love the aroma will enjoy garlic seasoning. This entry was posted in Uncategorized and tagged Soups. The season of the king of fruits is to arrive in another couple of weeks but for now though you can still take advantage of these raw mango based dishes. This thing I am putting today is one of them – it is called Appe Huli Saru and is one of the North Karnataka dishes that I learnt from my mom-in-law. 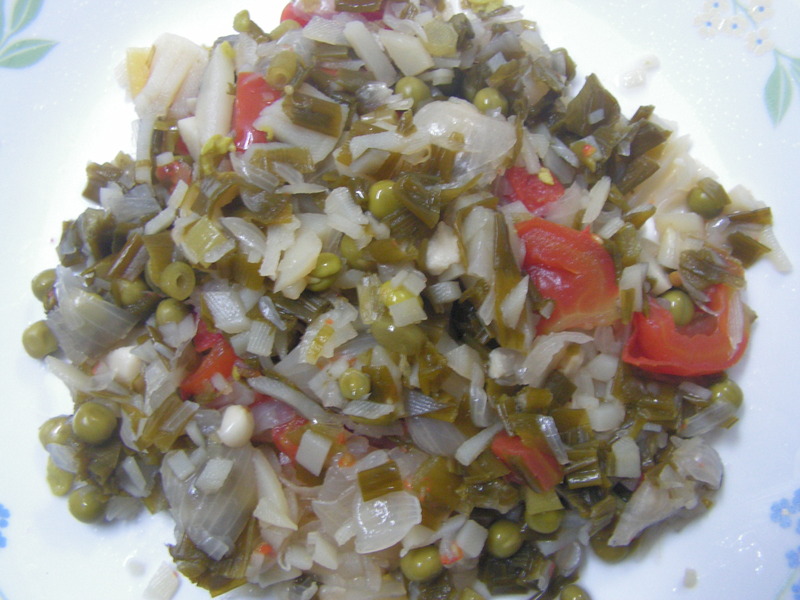 It is an easy and a simple dish and will be soothing for this summer. It is also a recipe that one of you requested. 1. Wash, peal, cut raw mango and cook it in the cooker till soft adding 1/2 cup water. 2. Transfer cooked mango to a broad based bowl and smash it well. 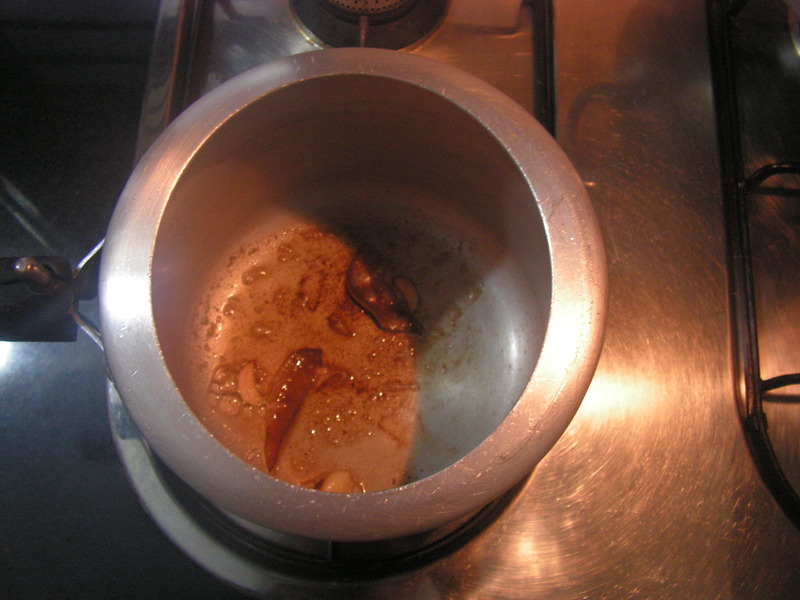 Add required quantity of water, salt to taste, Jaggery as per taste and slit green chillies and bring it to boil. 3. Check for salt and jaggery. Place a spatula with 2-3 teaspoons of cooking oil in it on the flame. Add mustard seeds to it and when it sputters add blackgram dal to it. When done add cumin seeds, asafoetida powder, cut red chillies and curry leaves to it. Season it to the dish. 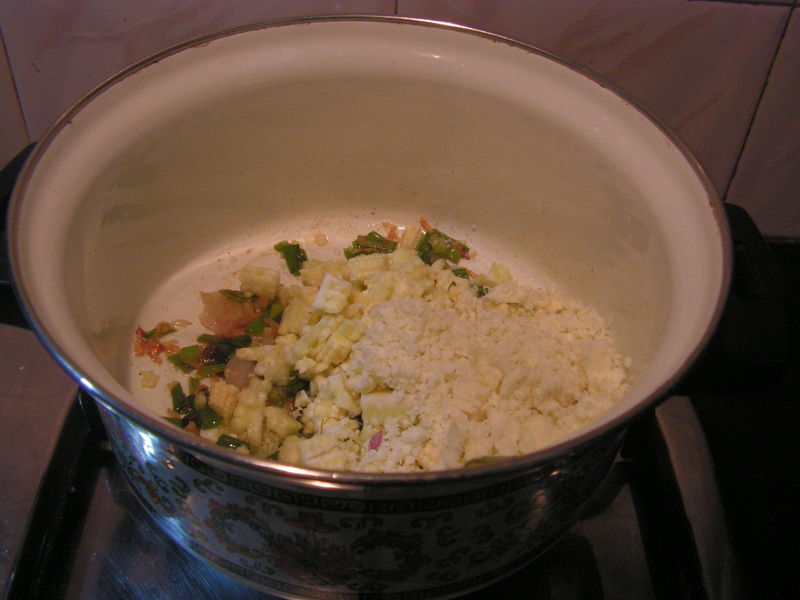 Ready to serve Appe Huli Saru is as shown in the image below. Enjoy with rice and any side dish of your choice. People even sip plain after lunch. 1. If the raw mango itself is very tangy, you can adjust the other ingredients – in particular, jaggery and chilli. Horsegram in English is Huruli in Kannada and Kulithu in Konkani. 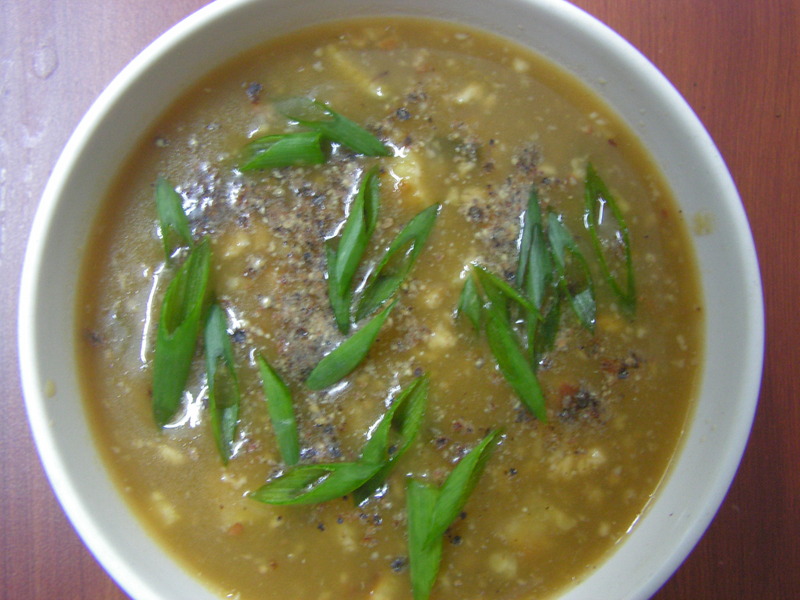 Horsegram soup is a monsoon delight – we enjoy it during this season only by seasoning it with garlic and cooking it in combination with Mangalore Cucumber and onion. It tastes great with a dollop of butter. 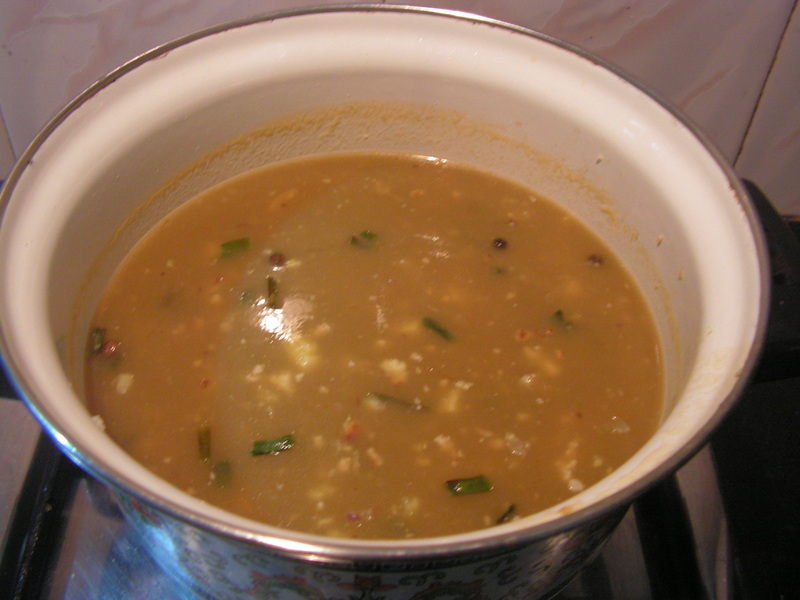 People cook Horsegram to feed the cattle during cultivation and we in turn consume the soup as a special dish and enjoy. 1. 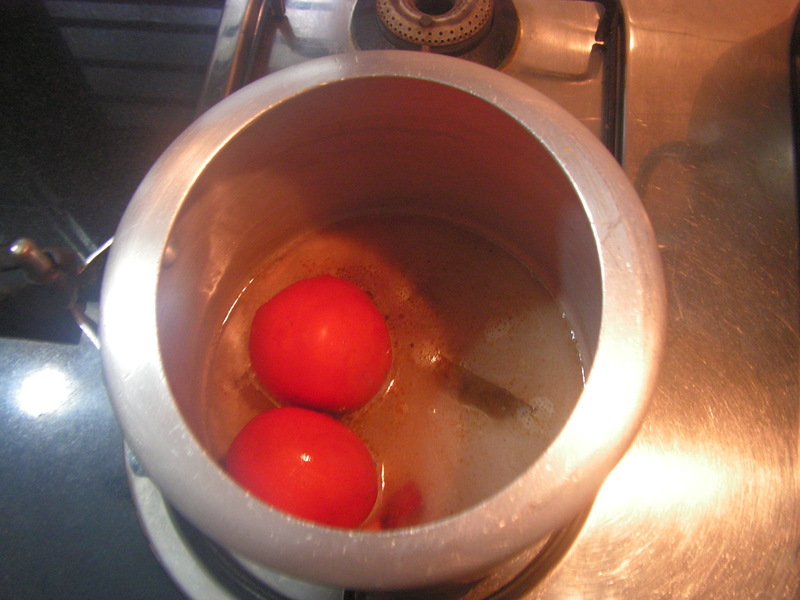 Wash and cook Horsegram in the cooker adding sufficient quantity of water on medium flame for about 30-45 minutes till it is cooked. On pressure being released, drain soup from cooked lentil. 2. Wash, peal and chop Mangalore Cucumber, chop onions and cook both of them in the soup on a medium flame till they are cooked. When done add required quantity of salt and bring it to boil. 3. Place a spatula with a teaspoons of cooking oil in it on medium flame. When heated add red chillies and just fry it for a while. 4. Grind fried Chillies, grated coconut, tamarind in the mixer adding water in steps to a fine consistency. 5. Add the ground masala to the soup from step-2 and bring it to boil. 6. Place a spatula with 3-4 teaspoons of cooking oil in it. Add crushed garlic pods to it and fry it till brown and season it to the soup from step 5. Serve it hot with a dollop of butter and enjoy. This entry was posted in Uncategorized and tagged Lunch side dish, Soups. Any body would be surprised at the name of this recipe. But this dish so easy to prepare and yet tastes so great that there is very little to lose by trying this one. This goes well with rice and some spicy side-dish combination. 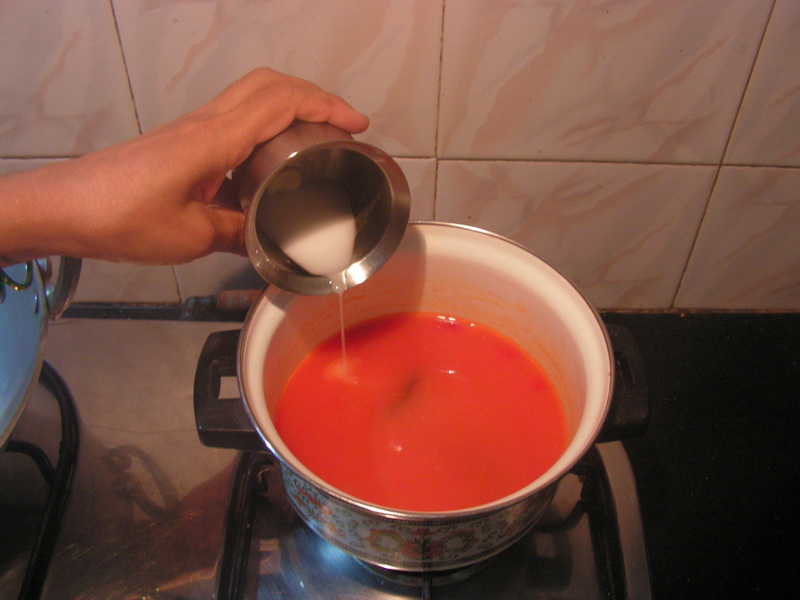 Or of coure you can sip it like you would sip tomato rasam. 1. Wash, peal, and cook potatoes in the cooker till soft as usual. Wash and slit green chillies as well and keep it aside. Chop coriander leaves also. 2. On cooling either crush them with your hands or grind it in the mixer to a medium coarse consistency so that small pieces are left over in it. 3. 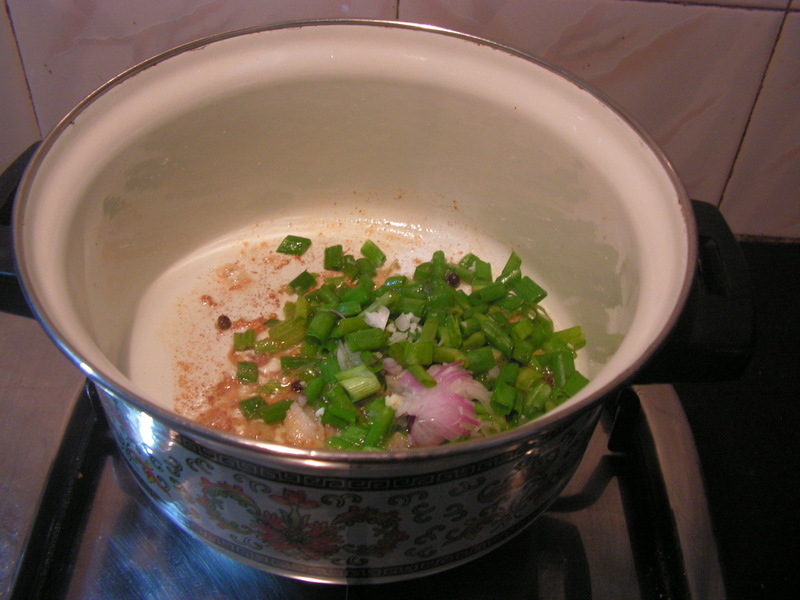 Add 3-4 glasses of water, slit green chillies from step 1, salt to taste, tamarind and bring it to boil. 4. 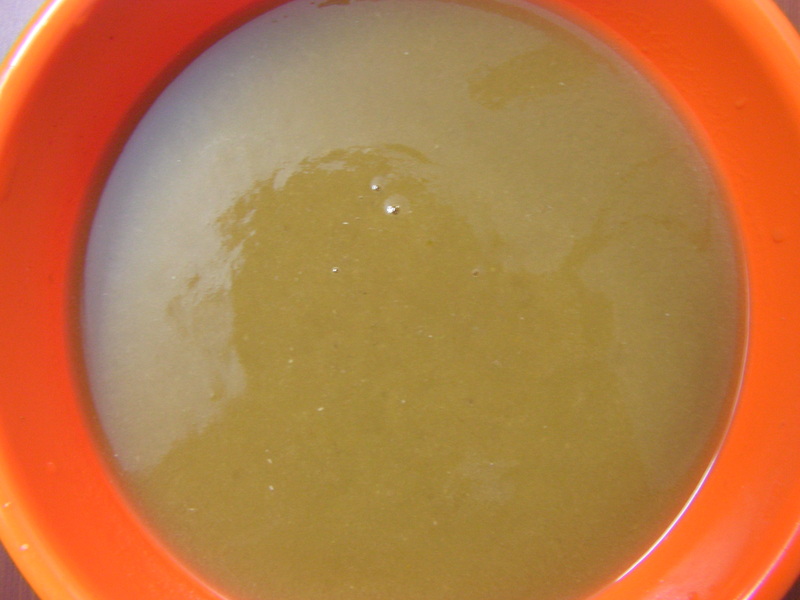 Dissolve the soft asafoetida in a little water and add it to the dish while boiling itself. Add chopped coriander leaves from step 1 to the dish. 5. Place a spatula with 2-3 teaspoons of cooking oil in it. When heated add mustard seeds to it. When it sputters add cumin seeds, asafoetida powder , red chili pieces one after the other. Lastly add curry leaves and season it to the dish and close the lid for about 5 minutes. 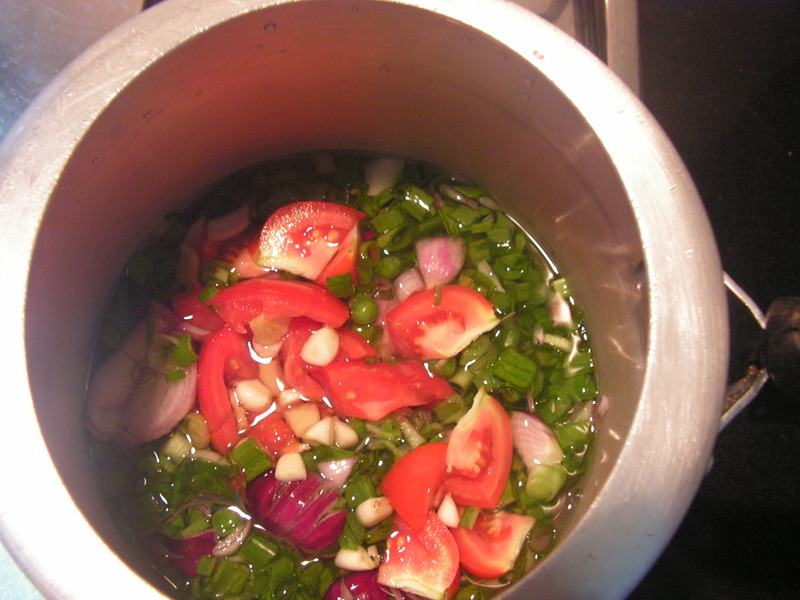 This entry was posted in Uncategorized and tagged Konkani dishes, Soups.